Lucifer shifts gears a little and focuses on finding out who stole a shipping container with some personal signficance to the Prince of Darkness. There’s a murder as usual and Lucifer is drafted to work the case with Chloe but this episode is a bit different as the murder plot is almost incidental. The real meat of the story comes from deconstructing Lucifer as a character and really adding depth to the others in the show. Lucifer’s reaction to the theft is interesting as he seems to take it in his stride at first. If people go to so much trouble to steal it then they deserve whatever it is that’s inside as far as he’s concerned. This irritates Maze who makes him consider it from another angle. If he turns the other cheek at this theft then it sends a powerful message that stealing from the Devil himself is no big deal and that kind of reputational damage is impossible to recover from. If nothing else, Lucifer is motivated by ego so this focuses his intention on recovering the stolen items. He likes to be feared and respected by those around him. He makes no secret of the fact that he thinks that humanity is beneath them and demands a level of treatment from those he encounters. There’s a sense of unease to the investigation as Lucifer seems to grow more desperate to recover his property as time goes on. Chloe notices this change in his behaviour and frequently comments on it. It is especially noticeable that he is less than forthcoming about the contents of the container when he’s normally brutally honest about everything. It’s a question that turns up frequently in the episode that is answered in various cryptic ways such as being a gift from his father. He finally reveals that the contents were a box of Russian Dolls as well as a secret compartment containing his severed wings. 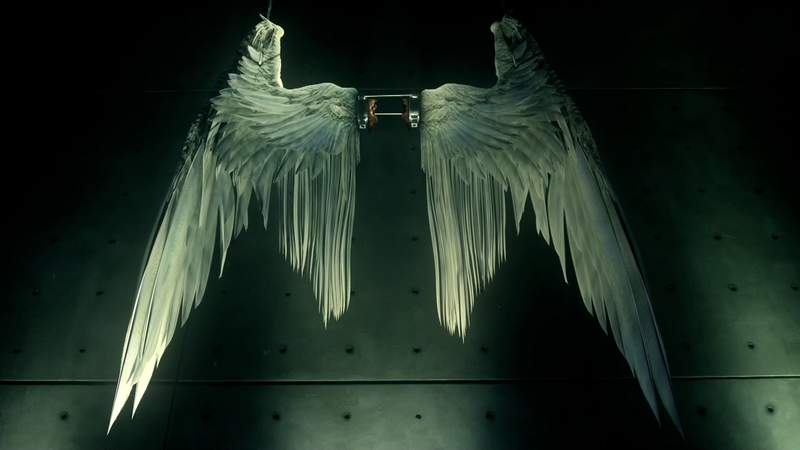 The Russian Dolls were all Chloe was told about and the wings are currently missing which marks a deeply personal loss for Lucifer. The mystery surrounding the contents of the container didn’t really work for me as it was always obvious that his wings would be in there. Based on what we’ve seen of the character before what else could it be? There were no other options as far as I’m concerned. I can understand Lucifer not wanting to tell the other characters but building it as a mystery for the audience wasn’t necessary. Tom Ellis really got to sink his teeth into different aspects of his character. 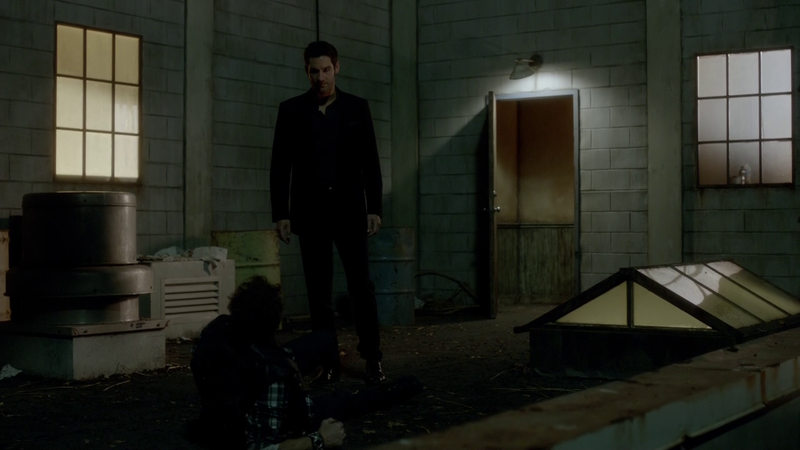 His performance is really engaging and varied as we see Lucifer dealing with more complex issues. The anger he shows at someone having the audacity to steal something precious from him is almost sinister in the way Ellis portrays it and the cracks in his persona showing lots of vulnerability are expertly handled. Much of this vulnerability comes through his therapy session with Linda. 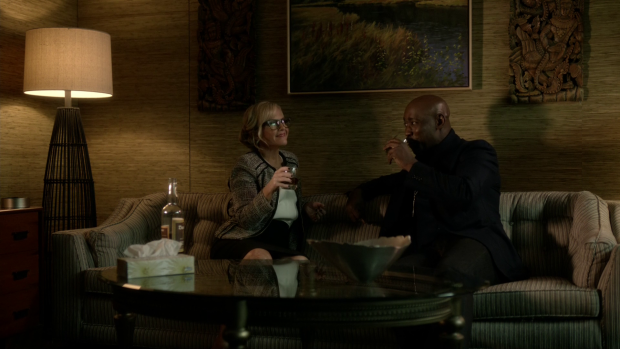 These sessions normally serve as a clumsy information dump but Linda -with Amenadiel’s help- pushes the right buttons and really gets under his skin. Using his original name of Samael the Lightbringer really touches a nerve and causes him to lash out violently. Lucifer clearly has unresolved issues around God’s decision to place him in Hell. Linda suggests to him that God did this to him out of love and gave him the job of looking after Hell because he was the only one who could be trusted to do it. Lucifer doesn’t see it that way as he feels he was deliberately set up to be a villain to make God look better. The idea of the devil on the shoulder is repulsive to him as he isn’t responsible for making human beings do any of the bad things he’s blamed for. His only role in their damnation is torturing them for what they chose to do. I really like this added complexity to the character. It’s interesting that he’s messed up on so many levels and struggling to hide it any more. If this was the kind of insight in this show from the beginning then we’d be onto a winner. Maybe this marks an improvement that will carry on. Chloe is given more depth in her role as a parent. She is trying to set a good example for her daughter in a world that makes it difficult to do so. Her separation from Dan is problematic as there’s a risk that her daughter will grow up without a sense of stability in her life. Dan shares Chloe’s desire to build a good life for their daughter and really wants to be a good father. He also wants to make sure that Chloe is a good parent as well as a detective. His contribution to the story does fall into the typical conflict between work and parenthood. His job threatens to make him miss a special day with his daughter and Chloe makes him feel really bad about that. It’s a frustrated emotional outburst on Chloe’s part but it’s good to see her showing real human emotion as she doesn’t seem to do that very often. Dan’s contribution to the story is better than it has ever been but he seems to be fairly stupid in the way he goes about things. The subplot where Maze knocks him out and puts him naked in Chloe’s bed was a bit too ridiculous and doesn’t paint him as being the most competent guy in the room. Chloe’s relationship with Lucifer has some added depth as she expresses fear that Lucifer isn’t being entirely honest with her about the contents of the container. Lucifer has never been dishonest with her before now so this is new territory for her and she is concerned at the prospect. She also admits that she enjoys working with him despite the madness that he brings to the table on every case. There’s definitely more to their interactions than the normal verbal back and forth that goes on and it’s great to see as it is a break from the norm. The strongest episode yet that shows some real depth and vulnerability to Lucifer as he is forced to deal with a personal loss and is confronted with his own deep seated vulnerabilities around his role in the eyes of humanity. Tom Ellis gives his best performance as the character yet and the supporting characters are largely given more to do. Dan’s subplot is a little too silly but Chloe is the strongest she has ever been.